The Vancouver Child Study Centre preschool is a place of discovery. Our curriculum goes beyond play-based; our approach is inquiry-based, inspired by the Reggio Emilia philosophy. This is a place to chart the remarkable growth of each student who walks through our door. Our Anchor program (for 2 year olds or those turning 2) is unlike any other in the city. Our preschool program (for 3-5 year olds) has a teacher-student ratio of 1:6, making it one of the best teacher-student ratios in the area. This truly unique program for toddlers and their parents grew out of an in-depth pilot study conducted in the 1980s at the University of British Columbia. Research results have confirmed the direct relationship between parent involvement in their children’s education and the level of child development and educational success. Classes take place on Fridays. 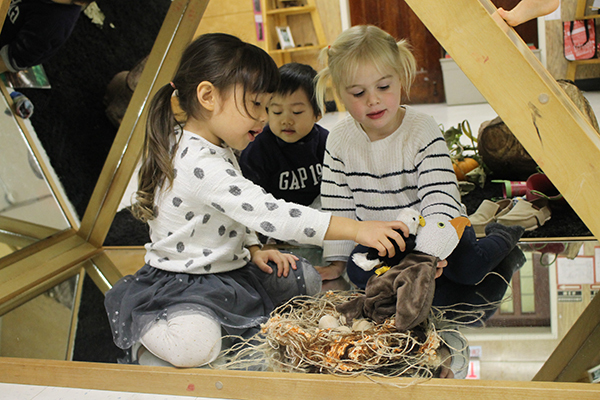 Our preschool program, based on the Reggio Emilia philosophy, involves activities in all areas of development, including art, music, science, mathematics and early literacy. We take pride in offering a secure and stimulating environment where children thrive both creatively and socially. Classes take place Mondays through Thursdays. “We visited many preschools hoping to find the right fit for our children, and from the minute we stepped in the classroom, we knew there was something magical about the school. VCSC truly stood out amongst many other schools we visited. The experienced teachers passionately transform the space to be incredibly inviting for young children to explore, create, learn and have fun. We have loved the play-based Reggio-inspired approach and feel it has allowed our daughters to thrive in their preschool years and beyond. We believe the Anchor program was a perfect way to transition to preschool, and our eldest has had a seamless transition from preschool to kindergarten. Our girls have such cherished memories from a dedicated, vibrant and positive preschool experience and we are grateful to have found this very special school.” - Kristin L.